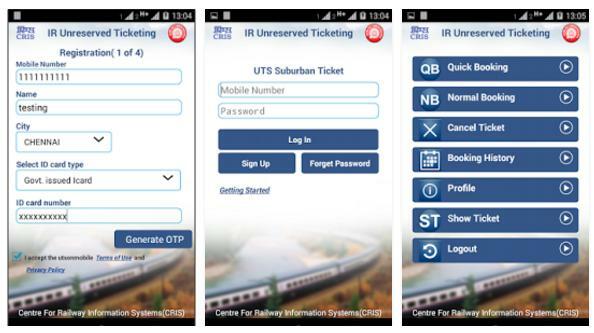 In January 2016, the CRIS and IRCTC had launched the UTSONMOBILE app that lets you book unreserved tickets in 4 metro cities i.e Mumbai, Chennai, Delhi, and Kolkatta. The app is very handy because it saves time as you don’t have to stand in long queues. To get started, download the UTSONMOBILE app on your phone through the Windows app store or the Google play store. The app size is around 3 MB on the play store. Run the app. You’ll find fields to enter the phone number/password along with a login/signup button and a link that opens the FAQ window. New users will have to register their UTS account if they want to book unreserved tickets. Registration is a lengthy 4 step procedure. In the 1st step, the UTSONMOBILE app will ask you to enter personal details like phone number, Identification type, ID card number, Name, and City. After you enter these details correctly, accept the terms and conditions and tap on the generate OTP button. The Unreserved ticketing system will now send you a one-time login password. In the 2nd step, UTS mobile app requests you to confirm the OTP after which it will display 3 drop boxes to select a train type, payment type and class. As of now, UTSONMOBILE supports Railway wallet payment mode and it allows you book tickets only in the ordinary trains. There are 2 classes to choose from, second and first class. When you select the options, tap on the done button. In the 3rd step, you’ll have to select ticket type and the number of persons/children that will be traveling with you. UTSonmobile app supports booking of return as well as journey tickets. In the 4th step, the app will sync stations available in the city you have selected, after which it will ask the user to select source and destination stations along with a preferred route. To confirm your ticket, the user must use the Rwallet to make the payment. The Rwallet must have a minimum balance of Rs 100 else you will not be able to complete the payment. The user can cancel booked tickets anytime before they get voided automatically. He can check tickets under booked history and show ticket menu. When the TTE asks you for the ticket, you have to log into the app. UTS online mobile app requires GPS access because it checks if you’re within 5 or 10 kilometer radius of the source station. You’ll not be allowed to book tickets if you’re not in the radius.